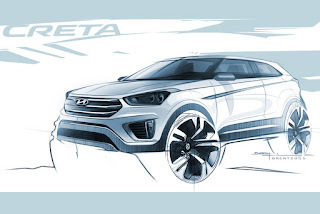 Hyundai Motor India Ltd. unveiled the design renderings of upcoming new Global SUV - Hyundai Creta. complete the premium SUV's design. A reinforced powerful figure, singular hexagonal radiator grille, sleek profile and a stable stance contribute to the bold and modern looks of Creta. The hidden A-pillar was applied to grant a unique and dynamic image as well as more open and airy cabin. Hyundai Creta is based on Hyundai's next generation and evolved Fluidic Sculpture 2.0 (FS2.0) Design philosophy. Fluidic Sculpture 2.0 Design philosophy carries forward the highly acclaimed Fluidic design theme in a more refined manner lending a Modern & Premium touch. FS 2.0 has achieved an evolution in design by adding class and greater value to its trendy styling and powerful posture.